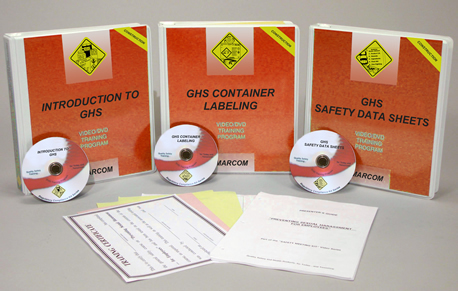 MARCOM's GHS (Globally Harmonized System for the Classification and Labeling of Chemicals) package consists of 3 DVD Programs, Introduction to GHS, GHS Safety Data Sheets and GHS Container Labeling. Each DVD program comes with a comprehensive leader's guide, reproducible scheduling and attendance form, employee quiz, training certificate and training log. The Introduction to GHS program reviews the requirements of the GHS regulations that OSHA incorporated into the Hazard Communication Standard. GHS Safety Data Sheets discusses the format used in a Safety Data Sheet, how it differs from the old Material Safety Data Sheet and what information is included in each section of the Data Sheet. GHS Container Labeling shows employees what elements are used in a GHS chemical label, the pictograms that the GHS labeling system uses and what information is contained in each of the text elements of the label.